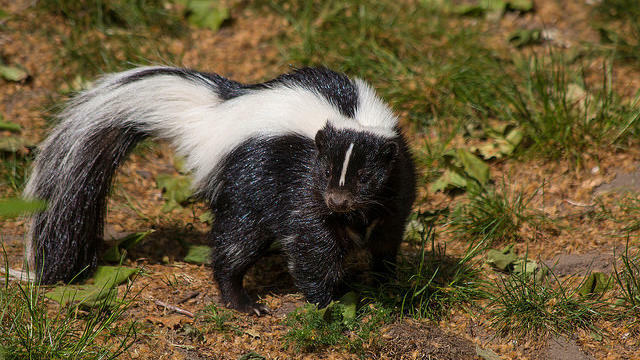 Mephitis mephitis: the egg-stealing striped skunk. Via Flickr user Hans De Bisschop. I am not an urban farmer nor do I play one on TV. But for the last three weeks I have been helping my wife and daughters take care of the three beautiful chickens who live across the street from us in San Francisco. On Saturday night, just as dusk was finishing up, my daughter Claire and I wandered across the street to bring the chicken feed inside and to make sure the hens were locked up safely in the coop. As we went into the backyard, I was surprised to see one of the hens still running around the fenced-in area in front of the coop. As we approached, she dashed into the coop. Not two seconds later, a skunk dashed out. “Goodness gracious!” I didn’t say. Claire was on top of the fence in a heartbeat. I followed her clear-headed lead. As we tried to figure out our next move, Claire phoned my wife, Susan, to give her an update. The skunk appeared as confused and panicked as we were. With no one to phone, it circled the yard for a minute and then headed toward the back door. “Claire, did we close the back door?” I asked. “I’m pretty sure we did,” she replied. We locked up the coop, not certain if chickens were unscathed. I grabbed the feed dish and we high-tailed it out of the backyard before the skunk returned to high-tail us. Susan was coming to meet us as we headed to the neighbors’ front door. “There it goes,” she cried, pointing to the skunk scurrying across the street. I took the dish into the kitchen only to discover that we hadn’t closed the back door. For some reason—the kitchen lights? the human scents (hey, the smell thing can cut both ways)? no welcome mat?—ol’ Pepé Le Pew decided to continue his way around the neighborhood without a house call. We Googled “skunks” and discovered that while they love chicken eggs, they will also attack and kill chickens. So we were delighted and relieved to find all three chickens waiting for us the next morning. Claire and I agreed that our neighbors, for many reasons, need a better henhouse. Fortunately, Westphoria has posted about a number of fabulous Chez Chicken options, including a clean coop, a drought-friendly henhouse, and the mother of all chicken coops. Do you have any tips on how to keep urban chickens safe?